What is Hub: A Hub is a networking device which receives signal from the source, amplifies it and send it to multiple destinations or computers. If you ever some across subject 'Computer Networking' then you must heard this word. 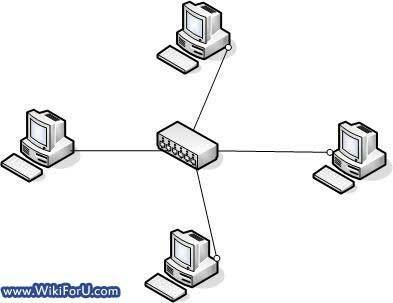 Sometimes, hubs are also called Ethernet Hub, Repeater Hub, Active Hub and Network Hub. Basically it is a networking device which is used multiple devices like Computers, Servers etc to each other and make them work as a single network segment. Hubs are used in 'Physical Layer' of OSI Model. Practically Hubs is a small box in rectangular shape which have multiple ports for connecting various devices to it. It receives its power supply from auxiliary power sources. The main work of Hub is to receive incoming data signals, amplify them in the form of electrical signals and then send them to each connected device. A Hub may contain a number of ports. Minimum amount of ports that a hub can have is 4 and it can have up to 24 ports for connecting various devices and peripherals to it. Active Hub: As its name suggests, Active Hub is a hub which can amplify or regenerate the information signal. This type of bus has an advantage as it also amplifies the incoming signal as well as forward it to multiple devices. This Bus is also known as Multiport Repeater. It can upgrade the properties if incoming signal before sending them to destination. Passive Hub: Passive Hub works like a simple Bridge. It is used for just creating a connection between various devices. It does not have the ability to amplify or regenerate any incoming signal. It receives signal and then forward it to multiple devices. Intelligent Hub: This is the third and last type of Bus. It can perform tasks of both Active and Passive buses. Also, it can perform some other tasks like Bridging and routing. It increases the speed and effectiveness of total network thus makes the performance of whole network fast and efficient. Hubs are used to create small Home Networks. Hubs are used for monitoring the networks. Hubs are used in Organizations and Computer Labs for connectivity. It Makes one device or peripheral available throughout the whole network. Thanks Dear. I am glad that you found it useful. Very good. Thanks Gurjit SIngh Ji! what about physical layer operation of a hub?? ?